A security guard checkpoint system, whether for a foot patrol, guard tour, or a mobile vehicle patrol checking on several client sites, is crucial to compete in today’s demanding security officer business industry. Checkpoint scanning, be it RFID, NFC or QR codes, provides your clients with peace of mind, which means that your client retention will increase. And including real-time check-point capabilities in your proposals means that a stakeholder considering your guard service bid knows that they will not have to worry about whether your officers are doing what your company was hired to do. An efficient security guard tracking checkpoint system backs up the reputation that you work hard to build, so you can win more clients and keep the ones you have. Request a demonstration and see how this security guard checkpoint system will help your guard company grow! 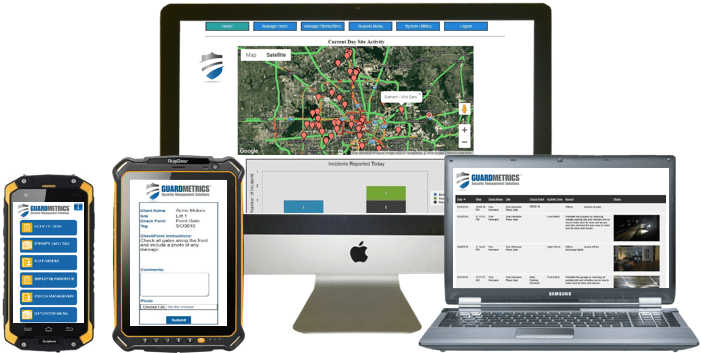 GuardMetrics makes scanning checkpoints and receiving scan reports simple and extremely user-friendly for you, your officers and your clients. When an officer scans a checkpoint the event is time-stamped and geo-tagged with a satellite photo of where the scan took place. And one factor often overlooked by security officer checkpoint tracking app providers; just because a checkpoint is scanned that doesn’t mean that everything is alright. With one click your guard opens the correct scan report, auto-populates the time and location data, and dictates any relevant data and attaches pictures or video. 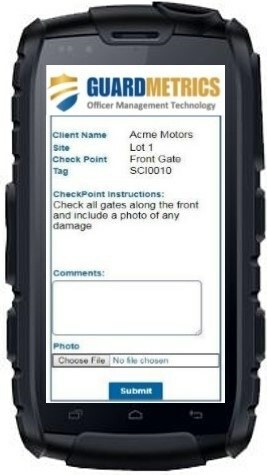 The officer can then simply submit that scan to your officer management system in real-time, where it can be accessed by your assigned guard company management and administrators, to disseminate to your clients when you choose. Incident report alerts are automatically sent to any internal personnel that you choose. Mobile officers can also simultaneously push less urgent reports–perhaps a maintenance/ lights out issue–to an email group that you specify; alerting “Maintenance” (in this example) of the issue. GuardMetrics even makes a next-generation “Client Portal” available to any of your clients, where your clients can access only their own reports, any time they choose, from anywhere, and in any way they wish to see the data. Call a security guard checkpoint system expert to see how smooth the process is! When your client receives their report they will be duly impressed. First of all, the security guard checkpoint system is branded to your security guard company, removing all mention of GuardMetrics and replacing it with your company name and logo. Your client will receive a clean, professional list of checkpoints scanned, including notes, photos and timestamps. If they then choose, they can click on “details” and get the satellite picture showing where the tag was scanned (if approved by you). There is no question whether your guard patrols, tours and your company have performed as agreed. Request a demo of this easy, real-time security guard checkpoint system, branded to your security officer business.